SPAN is a free real-time “fast Fourier transform” audio spectrum analyzer AU, AAX and VST plugin for professional music and audio production applications. This is a quality little spectrum analyzer VST available for both Windows and MAC to be used in conjunction with your DAW. 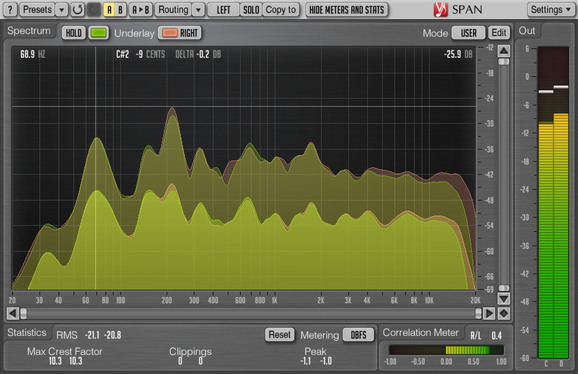 SPAN provides you with a very flexible “mode” system which you can use to setup your spectrum analyzer preferences. You may specify Fourier block size in samples, FFT window overlap percentage, spectrum’s visual slope. Beside that you can choose to display secondary spectrum of a desired type (e.g. real-time maximum, all-time maximum). Spectrum can be smoothed out visually for an easier examination. SPAN supports multi-channel analysis and can be set to display spectrums from two different channels or channel groups at the same time. Spectrum’s colour can be chosen to taste. We have provided the download links for both Windows and MAC users below. To visit the official Voxengo website with full details on the software click here.